Lifelong Financial Freedom in Singapore: Is money a form of liabilities? Is money a form of liabilities? The above picture is an Inflation rate (consumer prices) (%) chart. 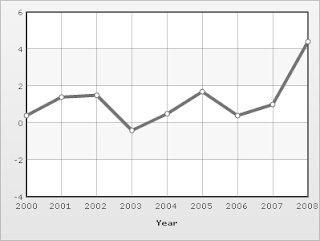 It shows that most of the years between 2000 to 2008, the rate is positive. So it means that the value of the money will reduce most of the time. So if you keep the money in bank with low interest (or under your bed), the value of money will keep dropping. Based on my previous post on Assets and Liabilities, I mention that Liabilities are things that you owns which take money from you. So doesn't it mean that money itself is also a form of liability? Click there to see how much does a plate of chicken may cost in year 2040. Housing loan, make it 15 years or 30 years? How to reduce your liabilities to zero. Expenses of a married man with a kid. How much does a plate of chicken rice in 2040?